Yes, sometimes the price of oil goes down, it happens and it is NORMAL! If you admire the paintings with a magnifying glass you will wonder if it is necessary to visit the museums. However, if you go back a few meters you will not regret your visit. Even if the black gold remains in an uptrend in the long term (years, decades) that does not immunize corrections in the short term (months). With the onset of winter in the northern hemisphere, the winter begins to oil. And yes this year summer ends, winter is the peak period for oil prices and oil companies (to make life easier for the oil to be consistent courtesy). 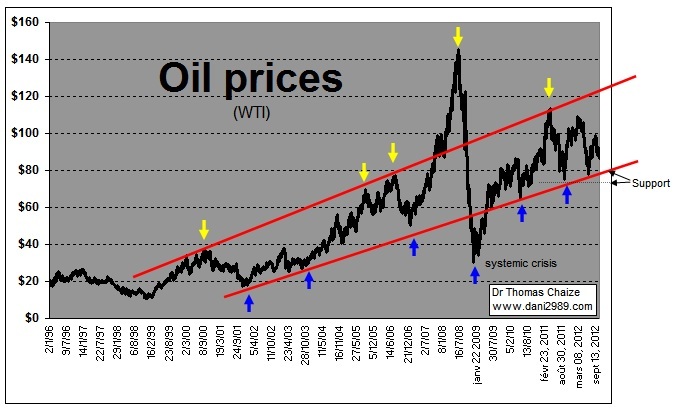 For 12 years, the oil price is moving in a bullish channel very clear (in red). It affects generally the bottom of the canal in winter (blue arrows) and upper channel in summer (yellow arrows). That is why, if you are a patient investor, statistically, the best time to purchase your multi fetish at low PER, generous dividends, your junior hopeful to leverage stratosphere is when it's cold. But beware, even if it is normal that the oil falls during the winter, do not expect the sinking of the barrel. Because for the price of a barrel of oil so the bottom of its bullish channel for six months it took the worst systemic crisis since 1929!! But in fact, the best time to take an interest in oil, is when it goes into its period of depression in the heart of winter. You will need to show conviction as newspapers, manic-depressive nature, will be in their depressive phase. They will explain for various reasons, more or less exotic, the world has too much oil that OPEC produces too that oil demand is anemic, etc.. But do not blame them, they help us to offer these opportunities. 1° If this winter, the price of oil down to $ 80, $ 75 to see two big media, it would be a good buying opportunity across months. 2° If it goes through the bottom of its uptrend channel (less likely, even very unlikely, but not impossible) it would be an exceptional buying opportunity across years.